Scroll down to bottom of write up for results. Stay tuned for the Nifty Mixty, happening soon, date tbd. The Nifty Ten Fifty 2018 was held in what could be described as "perfect cycling weather." Early morning temps were in the mid 50's and rose to the mid 60's as the morning gave way to a sunny, but cool, afternoon. We had 40 registered cyclists, less than some previous years, but a good number to keep from clogging the roads. We had the usual fast dudes heading out early, and of course we never saw them. Names like Bill Laddish, the undisputed overall King of the Nifty after so many years, Hanns Detlefsen, Travis Retzer, and Eric Chodoroff. And a newcomer, Alex Stevenson, who takes the overall 2018 Nifty KOM title. Eleanor Wiseman, and Arielle Little returned as the fastest of the female persuasion at the event, but unfortunately, there were only two other women in attendance. This meant that only 10% of the participants were women and this is probably the only disappointment of the day for me, Mr. Nifty, your host. After all riders were on the road, I closed up shop and headed out. 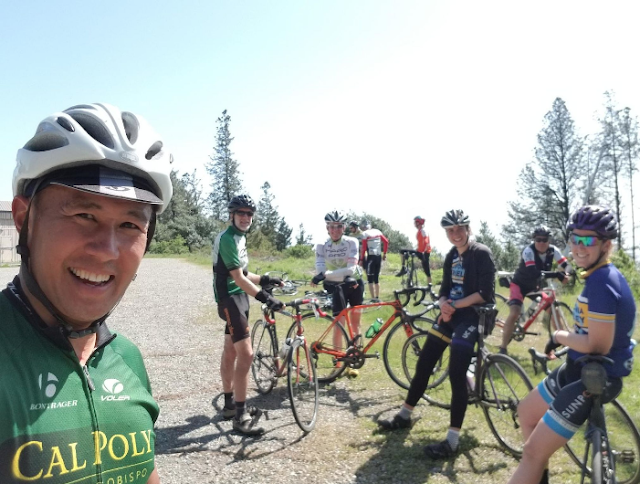 Fortunately, I had a posse of a few good friends, who I'd like to think wanted to ride with me, but it was as likely as not that they just wanted to have a guide so they didn't have to navigate ;-). All kidding aside, we did catch a few more riders, and we ended up with a group of ten to a dozen, who stuck together for the entirety of the ride. This made the experience most enjoyable, and very social. Marin Ave did not disappoint, always so difficult. But everyone made it up in good form. Traffic keeps Will honest as he crests Marin Ave. Sorry, no Paper Boy weaving here! Mike Nachtway (standing by signpost), and friend, came out to spectate the suffering on Marin Ave. Mike captured the Nifty marquis photo (with Marin Fountain) used on the Nifty site. On that event, a decade and a half ago, Tom and Cindy Long became the first tandem pair to complete the Nifty... a very bold move. With Marin Ave out of the way, our group bonded, and we rode together for the rest of the day. We had a nice lunch stop at Safeway in Montclair where various treats were enjoyed. Will shows how its done, with Ak Mak crackers and some sort of hummus dip. Bystanders were in awe of the sidewalk feast. With tired legs the group tackled the latter part of the course, traveling interesting roads above Montclair. I'd made a joke about turning on Pinehaven Road after Uranus Avenue, and Dave S. quipped, "Don't go up Uranus!" Thorndale was the second timed KOM climb, and I hit it hard with rubbery legs. What an amazing, remote, crappy, steep climb! I love it. The road was closed (but passable) at Elverton, and we took a group photo with the heavy equipment. No, not the bicycles, the yellow rig in the backgound, parked to block the road. At Elverton Dr. (l to r) Swill, Paul F, Dave A., Matt, Eleanor, Paul M, Jeff, Dave S, Arielle. Photo by Charlie, Mike Solis M.I.A. Our group got through the Hiller Highlands' brutal climbs without incident. We elected not to stop at Peet's Domingo, and carry on to Vollmer Peak to finish the ride. Charlie killed it on this climb, dropping all of our group, and everyone else arrived at the finish in short order, to a small, but enthusiastic cheering crowd! We stuck around for a while and socialized, before parting ways. I led a group back to the start, those who had driven to the event, and we all headed home, very happy with our accomplishment for the day! My time on the course was a bit under 4 hours 50 minutes riding time, about a half hour slower than the old days. The fastest guys today completed the ride in about 4 hours flat riding time. The Lanterne Rouge award is a really tough call in 2018. In order to qualify, you must complete all three of the timed climbs, and you must be as far down on the leaderboard as possible. Mark Ward looks really good, finishing second to last on Thorndale, and last on Claremont. But I don't have a time on Marin Ave for him. Next in line is Scott Wikstrom, who finished third to last on both Thorndale and Claremont. But his fast time on Marin Ave, of 12:10 certainly DQ's him from the being considered for the award. Heck, he beat a half dozen people on Marin, and that time probably indicates no walking or stopping! Sorry Scott, you'll need to slow down on Marin if you want to contend for Lanterne Rouge. Next in line is Richard Chadwick. Richard finished fourth from last on both Marin and Thorndale, and then put in a weak performance, at least in terms of Lanterne Rouge, by being fifth from last on Claremont. Feels odd to give the award to a rider who was never that close to the bottom of the leaderboard on any of the three climbs, but I guess there is something to be said for consistency. Congrats, Richard! Special congrats to Eleanor Wiseman, and Alex Stevenson, Nifty 2018 Queen and King! Stay tuned for the Nifty Mixty, the gravel version of the Nifty Ten Fifty, coming soon at a location near you! Results for all three timed climbs on the Nifty Ten Fifty are in! Note: updated April 9, to include some pesky "late uploaders." 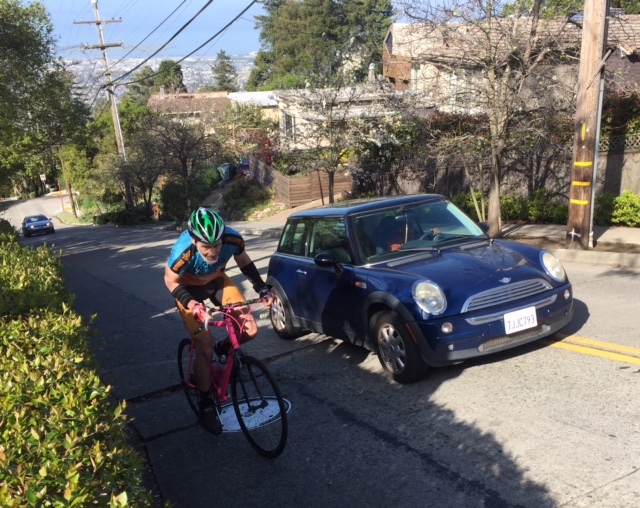 Alex Stevenson is the new KOM on Marin, and Claremont/Grizzly/Vollmer, and as such, he takes the overall Nifty KOM title. Marin Ave. This .75 mile climb includes the steepest paved 1/2 mile in CA according to my sources. It's a short effort, and legs are fresh. Big Watts are required to take this one! 1 Alex Stevenson 6:50 KOM! 2 Travis Retzer 7:09 457W! 16 Eleanor Wiseman 10:00 QOM! Claremont/Grizzly/Vollmer: This climb is the final, and longest of the day with 1500' of elevation gain, and some very steep sections. Riders who do well here demonstrate a high level of endurance. Congrats again to Alex and Eleanor, for their KOM/QOM rides! And to Charlie, a 55+ rider who was wearing his big boy pants on this one with a sub 30 minute effort! how do you guys figure out the winner? it seems like if you add the times, Travis easily beats Alex. "Unkown," I do not use cumulative time to determine the overall Nifty Champ. The reason is that Claremont/Vollmer is over 3x longer than Marin, and hence cumulative time would essentially make the performance on the final climb 3x more important than the epic Marin Ave. Instead, I use placing, such that Marin and Claremont/Vollmer are weighted equal. Thorndale is a filler climb, an additional challenge in the middle of the ride, and is a tie breaker, should, say, two riders exchange 1st and 2nd places on Marin and Claremont/Vollmer. As such, Marin and Claremont/Vollmer both count 2x, while Thorndale is 1x. So... you take your placings on Marin and Vollmer x 2, then add your placing on Thorndale, and that is your score. Lowest score wins. Using this technique, Alex scores 9 points, and Travis scores 10 points. if there is a tie, it is broken by who has the better placings on Marin and Claremont/Vollmer. So even if Alex had finished one place lower on Thorndale, tying Travis' score of 10 points, he still would have won. Travis' performance was amazing, very consistent, with 2nd place on all three climbs. Remarkable performance on this ride for a big guy! Congrats to both Alex and Travis, and everyone else for that matter. Thanks for clarifying... yes, Travis is a beast...I've ridden with him. For your amusement - I was riding with a couple, the Katsmas (you caught up with us on the bottom of El Toyonal when we chatted about making the correction to the route on Claremont). Diane had the cool bike with big tires. They have only recently taken up cycling. I left them at Elverton and Skyline, as I had to return home, but later realized I had not updated them about the fixed route. Would you believe it? They completed the whole Lite route INCLUDING the fire road from half way up Claremont to the top of Grizzly Peak! (I wanted to include a photo here but don't see an option for doing so). Alexis, OMG, I'll bet that was quite an adventure, and I hope they had their mtb shoes on. That fire road is very steep! Please convey my apologies, unless of course, they had a great adventure, in which case they can thank me!